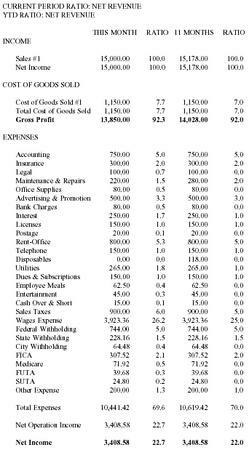 This business plan for an ethnic restaurant is highlighted by an exhaustive financial analysis, complete with monthly projections. The fine attention to number specifics indicates an understanding of all the details that go into running a business. Furthermore, stressing the owner's personal financial investment underscores his commitment to success. This business plan is for Calypso Cafe, owned and operated by Josh Benson. It will be a multicultural restaurant which will serve clients desiring Jamaican and American foods. Calypso Cafe seeks to meet the needs of the varied and growing ethnicity of the greater Fort Wayne area by being the first to offer authentic Jamaican foods. Food from this restaurant will be prepared primarily from fresh food products. This restaurant will seek to create a Caribbean atmosphere. International music and culture will be incorporated into the restaurant through paintings, murals, and West Indian reggae music. The restaurant's location is in the south central district of Fort Wayne. The restaurant's size of 1200 square feet will consist of the cooking area with refrigerator and freezer, counter eating area, dining area, waiting area for takeout food, and restroom. Planned financing for the restaurant is initially directed toward personal savings and the Micro-Loan Program, with later reinvestment of earnings. Calypso Cafe needs $15,000 to begin business. Plans are to borrow $10,000 from the Micro-Loan Program and $5,000 of the owner's savings. The money will be used to buy and lease equipment, pay rent, pay employees, pay product vendors, and meet various other expenses. Planned schedule for repayment of this loan is in the amount of $1,000 per month including interest. The management expects to repay all of the loan within two years of the loan date. There will be three full-time employees and the owner: a cashier, two cooks, and the owner/manager. Management plans to adopt a "just in time inventory system" to avoid unnecessary refrigeration and excess stock. To effectively and efficiently manage the inventory, there will be an independent buyer for the restaurant. The owner's previous experience in restaurant management has led to his desire of wanting to own and manage a restaurant. Currently, he operates his own catering service, J&A Catering and Entertainment Corporation. He services special events and plans to incorporate this business into the new restaurant, Calypso Cafe. His work with Burger Boy Restaurant in Fort Wayne, Indiana, was so successful and profitable that he was introduced to the idea of owning his own restaurant. His higher scores of evaluation and good standing with Burger Boy earned him an opportunity to create some menus for the restaurant. He has worked for Burger Boy from 1992-1996. His responsibilities include line cook and kitchen management. His goal is to own and operate a restaurant where he can utilize his professional skills and proven experience. Josh Benson's experience and skills in restaurant business go back as far as 1981. From 1991-1992, he served as a cook at Burger King Restaurant in Fort Wayne, Indiana. From 1990-1991, he worked as a cook for Popeye's, Fort Wayne, Indiana. In 1990, Josh held two jobs as a waiter at Cyprus Inn and My Place Restaurant in Fort Wayne, Indiana. In 1989, he was the manager and social director for Bella's Resort in Kingston Harbor, Jamaica. At Bella's he was responsible for managing the bar and planning special events for the guests of the resort. Josh has also experienced an extraordinary activity during his years of professional service. From 1986 to 1988, while working at Blue Waters Resort in Kingston Harbor, he overcame Hurricane Gilbert by using his leadership skills and positive sense of direction to manage tourists during the disaster. He was able to take charge of the situation and control panic. From 1981-1985, while working as a fine dining waiter at Wonder Island Hotel in Kingston Harbor, Jamaica, Josh also attended school. After graduating from high school in 1981, he got his Certificate in Catering from Kingston Harbor Catering School. Josh's strengths include the ability to work long hours, use creative problem-solving skills, lead with a positive sense of direction, and give constructive criticism when necessary. His weakness is the tendency for impatience. He is willing to take risks such as when he relocated to the United States. Josh has also had other areas of interest before his career pursuit. He was awarded high honors for best performance in the Jamaican Combined Cadet Force for two consecutive years, while he was serving as a Corporal. He also played in the town band. While in high school, Josh was very involved with the track team. Josh is a family oriented individual. He is married and has children. He has lived in the Fort Wayne area for six years. In pursuit of his dream to become a successful entrepreneur, Josh is prepared to take a calculated risk. He has strong confidence in himself as a businessman and is determined to set clear, attainable, and challenging goals. Seeking to use my professional experience and proven skills in cooking. I desire a position which offers opportunity for personal and professional growth. High Honors: Jamaican Combined Cadet Force—Corporal, played in the Town Band, winning an award for best performance in 1984 and 1985, track team in 1978. The city of Fort Wayne is one of the largest in Indiana, with a population of approximately 175,000. The proposed business location for Calypso Cafe has a population concentration of approximately 76,000 that may be served by this restaurant. The average area income is $25,129 per household. The median effective buying income per household is $27,744. The effective buying power by group is 53% with households of $18,000 and over. The target age group is 18 to 64. The median age of population is 31 with ages 18 to 24 being 13.8%, age 25 to 24 being 15%, age 35-44 being 15.6%, and ages 45 and older being 27.9%. Young people are more prone to assimilation. They are more aware of changes that occur in their society as compared to the elderly. Youth prefer to get firsthand experience of something new, most especially when changes are taking place within their surroundings. A major part of this market survey has been conducted using data for social events such as Jamaican Reggae festivals, African-American festivals, and other cultural events. It has been proven that the majority of people at these events relate their fun in terms of what kind of food and music they enjoy. These events create memories to be shared with friends and family, the significant connection of people, music, and food unique to a culture. Through Josh's recognition by others, for the food he has prepared and served at such gatherings, and by the request of many community members to open a Jamaican restaurant, he has been inspired to pursue this dream. Josh has already established a market audience for the proposed restaurant. Recently, there have been many people who have come to him inquiring about such a restaurant in the vicinity. He has discovered that an increasing number of people go to a restaurant not necessarily because they are hungry, but because of the desire to experience a new or particular taste. Josh is confident that this restaurant will be successful to generate big sales and profit. The nearest competition for this kind of restaurant is in Chicago, keeping competition for Jamaican cuisine at a minimum. The proposed business district for this restaurant has already been established and is growing fast. With the opening of a large sports arena nearby, business is growing in Fort Wayne's inner city and surrounding area. The percentage change for the population in 1980-1990 was 1.6%, resulting in an approximated population of 76,000, and a projected requirement for fast food restaurants in the area to average about 15%. Therefore, it is possible to meet the projected sale of $200,000. McDonald's Restaurant serves a good breakfast and is famous for its Egg McMuffin and coffee. They do not use seasoning in their food. They use a regular broiler to cook their burgers and lard grease to fry. This type of cooking is undesirable to many customers and a big disadvantage to their business. Burger King offers their customers high quality service and a family oriented atmosphere. Food is expensive and generally unhealthy. Pizza Hut is an alternative food restaurant. It does not offer breakfast and has a limited menu. Kentucky Fried Chicken does too much deep frying. This is not healthy for customers. Also, a long wait in line is commonplace. Calypso Cafe is planned to provide meals that will take the customer on a culinary adventure. It is evident that natural food is more nutritious and healthy for the body, and Calypso Cafe plans to provide this healthy menu. The restaurant will prepare mostly fresh food products, using only a minor and unavoidable portion of frozen food products. The Calypso Cafe menu has been created quite differently from the customary American menu. Though food items may be similar to American foods, the special spices, ingredients, and methods of preparation will provide a unique flavor unmatched by any other. 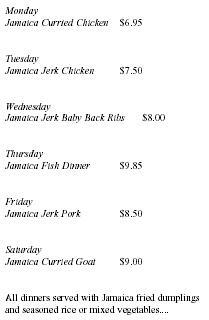 The menu has been created by the finest Jamaican cook. He sincerely hopes that customers will enjoy the entrees. The marketing plan for this restaurant is designed to incorporate the customer as a share benefactor in the profitability of this business. The goal and profitability of this restaurant will be attained through the guarantee of customer satisfaction. 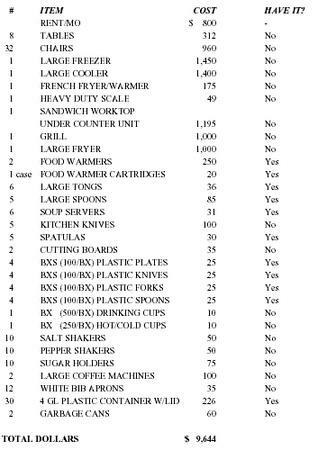 There is provision for additional menu items. Customer suggestions and evaluations will be considered. Calypso Cafe expects to build an enormously successful restaurant through emphasis on product and service. Quality work produces more than just a steady income, it leads to an endless stream of referrals, more business, and higher profits. New competitors pose a threat to related and existing businesses, however Calypso Cafe policies will constitute a strategy that will be oriented toward creating the highest quality image possible—fresh, high quality food products, provided with outstanding service. The impact of social and economic concerns in the community play a vital role in the success of a business. In turn, Calypso Cafe will strive to contribute to the community through charities, participation in anti-drug programs, and employment of area residents. Advertising media for Calypso Cafe will be via radio, newspaper, telephone directory, direct mail coupons, and customer referrals. The restaurant will be located in one of the popular zoning business areas of south central Fort Wayne. There is direct access from the expressway. Also, there is easy access from other smaller connecting streets. There are three fast-food restaurants and a donut shop within the two block radius of the proposed business site. This area was chosen as it is a successful business area. Through its history, the district has expended and attracted new businesses. Josh will set goals that are consistent with his interests, values, and talents. His belief in the ability to achieve his goals is needed to succeed. The desired profit by the end of the year, decided before opening, is $3,480. Through continuous planning, profits are to be increased every year by 30 to 50 percent after the first year. While expecting to make money, the main motivation is not wealth, but to do something extremely well. Recognizing that money is an important factor in running a business, Josh has decided not to use profits as a route to wealth, but as an indicator of the success of the business. On the average, U.S. companies make about 5% net income. Calypso Cafe must make enough profit to provide continuous growth through reinvestment. 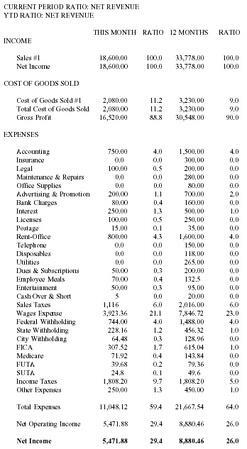 There must be a profit after all normal business expenses have been accounted for, including fair wages for the owner. Calypso Cafe will be financed initially through combined savings of the owner, his friends and family, public offering, the Micro-Loan program (Small Business Administration), commercial banks, trade credit, and credit extended by equipment vendors. The owner's drawing account is not expected to be active until the restaurant is fully established or after three years of successful operation. Earnings will be reinvested and the owner will be an employee when collecting his wages. This step ensures that debts incurred by the restaurant are paid for within the shortest possible time to help other businesses on the waiting list to secure loans. Before the bank failures of the 1980s, capital funds were readily available to small business people and prospective entrepreneurs. The Clinton administration's economic reform and small business incentives has made more money available today than at any time in recent history. This is due mostly from consumer savings in liquid investments. The SBA received a new influx of funds, however, the demands are high because of the growing economy. Small business owners appreciate the efforts of the Urban League to offer opportunities and programs for small business loans. With respect to this, Josh Benson has high hopes that his business operations will commence in the shortest possible time. Calypso Cafe will be a sole proprietor ownership so that it can be content with the limited startup capital. The owner's plan for instantaneous growth of this business is to reinvest earnings. Reinvestment will be the backbone of this business after start-up. Reinvestment will also ensure a smooth transition of its incorporation in the future. In the initial stages, this business can not exist independent of its owner. However, the most important legal aspect of the sole proprietor type of ownership is its unlimited liability stature. Personal assets of the business owner can be seized to settle claims against the business. The owner in this case takes over all the operation aspects of the business and makes decisions as he pleases. The characteristics of a small business establishment make it more comfortable and compelling to organize in this manner. Josh Benson intends for the attorney of the business to act as a consultant on business decisions that are legally connected, since the attorney presumably has the expertise necessary to handle the legal records of the business. The management of employees in the service industry involves several interrelated personnel activities: recruitment, selection, training, compensation, and supervision. The goals of this process are to obtain, develop, and retrain employees. Calypso Cafe will employ between two or three people in the future. Recruitment of retail personnel will be done through sources of potential employees from educational institution, employment agencies, employee recommendations, and from within the business when it expands. Compensation would include direct monetary payments and as the business progressed, some indirect payments will be paid to full-time employees. Because this is a small business, personnel will be paid a comfortable wage and possible bonuses. Total compensation would be fair to both the employees and the business. In the event of a difficult situation, the business banker, lawyer, insurance agent, and accountant would be consulted. The manager would be responsible for organizing money, pricing, handling produce, equipment, and people resources. The manager will also arrange the organizational environment so that employees can achieve their own goals by directing their efforts toward business objectives. Employees will be responsible to give friendly, courteous, helpful, and honest service at all times. The Calypso Cafe image will be built around the special services offered. 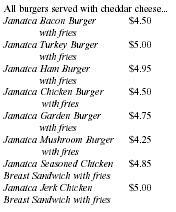 Since the Calypso Cafe will be in its introductory stages, purchases will be paid for in cash and check only. In the future, Visa, Mastercard, Discover, and American Express will be accepted. In the future, charge accounts will also apply to contract agreements for food services at organized functions. Credit policy requires the establishment of the major policy variables within which accounts receivable will be managed. These variables include deciding to whom credit should be extended, the length of time allowed for payment of invoices, and whether discounts will be offered for prompt payment. It is also possible to use accounts receivable as collateral for a short-term loan. It is even possible, under an arrangement known as factoring, to sell accounts receivable as a discount to a commercial bank or a commercial factor. This type of arrangement relieves the business of needing to make additional credit policy decisions. Once the policy factoring is established, the factor will dictate credit terms. The final working capital policy issue deals with the establishment of an account payable payment policy. Suppliers commonly offer discounts on accounts payable to induce prompt payment by customer. There are two major concerns in establishing a business' payment policy. The first concern is cost and availability of money. The cost of missing the discount can be translated easily into an approximate annual percentage rate of interest: the shorter the lending period, the higher the cost of missed discounts. Once the discount is missed, payments should be delayed until the latest allowable payment date. As a general rule, a business should not make an early payment after the discount is missed, or if there is no discount. The second major concern involves establishing an accounts payable payment policy and its impact on the business' credit rating. Calypso Cafe will pay their payable promptly and take discounts even though the discounts are not particularly attractive strictly on a cost basis. This is done because a record of prompt payment enhances the credit reputation of the business' future access to and cost of external financing. Attaining dreams requires new behavior, and new behavior involves taking risks. Lenders need assurance that a person is committed to their dream. The owner of Calypso Cafe will be risking some of his personal money and assets, reputation, and time. There is total commitment to this dream. From the perspective of a lender or investor, financing a new business always carries more risk than lending to or investing in an established enterprise. Many uncertainties vanish as the business establishes a track record. Most businesses take three years to generate enough ongoing income for a living wage. 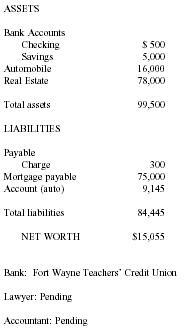 During those three years, personal living expenses, as well as equity capital for the business must come from the owner. Calypso Cafe has planned to reserve business earnings to eliminate hardship, including guarding against property damages, liabilities to employees and customers, and in the event of the owner's death. To prevent bad debts, cash only will be used for purchases. The store will have hidden cameras to protect employees, clients, and the property. The manager and other employees will be trained to spot criminals, and verification will be made on all payments made with checks. Management must also consider the risk that the business must assume in its business affairs. Economic theory and common sense both argue that a dollar of risky profit is less valuable than a dollar of certain profit. The two general categories of risk management must contend with business risk and financial risk, business risk being risk imposed by the business and economic environment. Financial risk is risk imposed by the manner in which the firm is financed. There are no set rules of regulation that will guarantee success. The following personal information is relevant as of October 31, 1996. # ITEM COST HAVE IT? Calypso Cafe is a planned multicultural restaurant. It will be one of a kind in the area with no direct competition. The owner, Josh Benson, has well established, practical experience in this business. The market survey and strategy promise strong success of this business venture. The restaurant's menu reflects diversity and its operational intent. Food from this restaurant will be prepared mainly with fresh food products. The restaurant's location is in a strategic area that will attract sales from targeted customers and shoppers in the area. The form of ownership for this restaurant will be a sole proprietorship. The owner will be in charge of all business operations, including public relations. Initially, the owner will have three employees and an independent buyer working with him. The owner plans to finance this restaurant through family savings and the Micro-Loan Program. He also plans to suspend the owner's drawing account in order to repay the loan amount including any associated interest within two years of the loan date. Further financing is intended to come from reinvestment of earnings. The owner is confident that the restaurant will be a successful business venture with prospects of future franchises.